No matter what type of pro offense Trent Richardson ended up in, he was going to be expected to run both the inside and outside zone play. It doesn’t matter if you are a West Coast team like the Browns, or a vertical passing team like the Raiders, every NFL team has the inside and outside zone plays as their base running plays. For some teams, the Colts for example, the outside zone is their only true running play. With the arrival of Richardson with the Browns, along with the addition of Mitchell Schwartz to an already talented but young offensive line, I thought it would be a good time to go back over the inside and outside zone plays, and how I think the Browns will integrate them in their version of the West Coast offense. Zone plays became the main rushing scheme for NFL offenses by default sometime back in the Eighties. Defenses had gotten so fast, and outside linebackers became so quick and strong, that teams became unable to turn the corner on the outside on what had been a staple of every team’s offensive package, the power sweep. It was the power sweep that lead the Browns, Packers, Giants, and Lions dominate football in the Fifties and Sixties. When defensive coordinators started to figure out that their linebackers had become as fast as safeties and as big as defensive ends, their defenses could just keep stretching out the power sweep until the offense encountered the sideline. The sideline became like another defender, a twelfth man, and pulling guards and the running backs behind them weren’t turning up field anymore. Offensive coordinators saw what was happening and knew they had to come up with something. Outside running plays had become only successful when the back would cut back and find a hole running against the defensive grain. Teams had screwed around with zone blocking schemes in the past, but usually against unusual fronts or gimmick defenses. The pro and college coaches of the Sixties and Seventies had played for running teams in the Forties and Fifties, and most always favored man blocking schemes that were simple and easy to teach. Each offensive player besides the ball carrier and the quarterback was responsible for blocking a particular defensive player, and if you couldn’t do the job they would find someone who would. While offensive coordinators were dealing with bigger and faster defenses, they also started to play against multiple fronts each week. Most teams weren’t just sitting in a 4-3 look, some started to play a 3-4, and most teams today will play a combination of both. Throw in the fact you got linebackers and safeties moving around before the snap of the ball and offenses had their hands full. All of this lead to zone blocking, and the inside and outside (also known as the “stretch”) zone plays soon became a part of everyone’s offenses. Zone blocking schemes soon filtered down to the college and high school levels, and linemen in good school programs could both zone and man block. The best definition I have heard of zone blocking is when the offensive line becomes one big picket fence, moving downfield, not letting anyone penetrate, allowing the back to pick a hole. There is very little difference on how teams block the inside and outside zone. The outside zone play usually has the running back reading the playside offensive tackle. If the tackle hooks the first man he is engaged with, the back will try to bounce the play outside. If the tackle blocks him outside instead of hooking him, the running back will run off the inside of him. If the tackle, and the frontside guard for that matter, don’t hook or block out anyone, the running back will bend back inside and look for a cut back hole. What decision the running back makes must be made quickly, and once a decision has been made he must stick to it. Even if he makes the wrong one, or the defense blows up the play, the running back will get what he can on the play and live to see another one. The inside zone has the running back reading the frontside guard and looking for the cutback immediately. If he sees a hole on the front side he’ll take it, but a backside cut is preferred. You can run a zone play out of one or two backs. If it is out of two, you can have the fullback block off the backside edge, making him in theory the last linemen. You can also have him lead the play, often isolating on a playside linebacker. You really need an athletic and experienced line that works well together to make zone blocking work. Linemen have to count on their fellow linemen to do their job. On zone plays some teams teach their linemen to take two horizontal steps to the outside and then turn and make your way upfield. Some teams have their linemen take a bucket step, then a vertical step, then attack up field. One thing is for sure no matter what, this only works when everyone on the line is stepping together. In its simplest form, the one I prefer, you engage the first defender who steps in your way, or in your zone. You don’t turn back to block anyone, and if you don’t engage with someone on the line of scrimmage, you go to the next level and block a linebacker or safety. If the defensive lineman over you stunts inside you have to count on the linemen next to you to block him. Everyone must do his job correctly or the picket fence will fall apart. Sounds simple, until you take in to account lightning quick defensive linemen like Jabaal Sheard, or 320 pound behemoths like the Browns have in Jason Taylor. Throw in blitzing linebackers and safeties and multiple front defenses, and you can see it is no easy task. Making the zone running plays succeed is an important part of any pro offense. When a NFL team is running the ball well, causing linebackers and safeties to come up and make too many tackles, it allows the passing game to open up. Football season is almost here and I am excited, as I am sure many of you are. By my next deadline for this fine publication we will have seen the Browns through most of training camp and three of their preseason games. I can’t wait to write about Weeden, Richardson, the young offensive line, and the suddenly greatly improved receiver corps, all coming together to hopefully be a championship offensive unit. This is the basic outside zone play out of a two back set against a base 4-3 defense. Notice the lineman all stepping together to the playside. 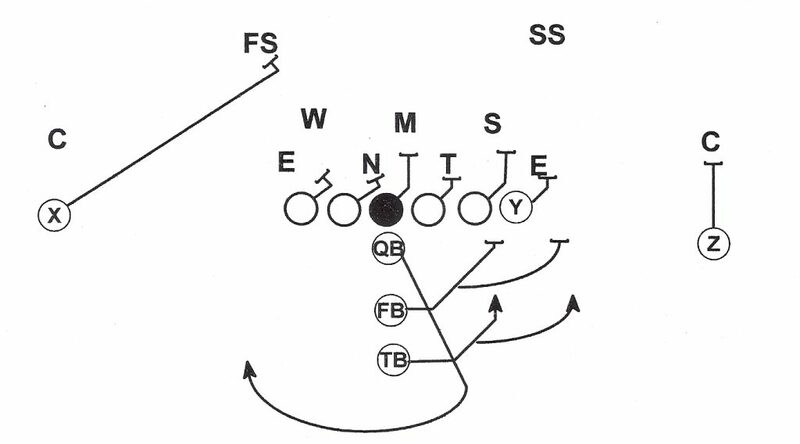 Out of this set the fullback can lead like he is here, or block backside and seal off the defensive end. The key is for the quarterback to get the ball to the tailback as deep as possible. This is something Brandon Weeden did not do in college, and he will do over and over before, during, and after practices this pre-season. Notice the tailback’s first two steps are parallel to the line of scrimmage, not immediately forward, allowing him to get a good read on the frontside tackle and tight end (“Y”). 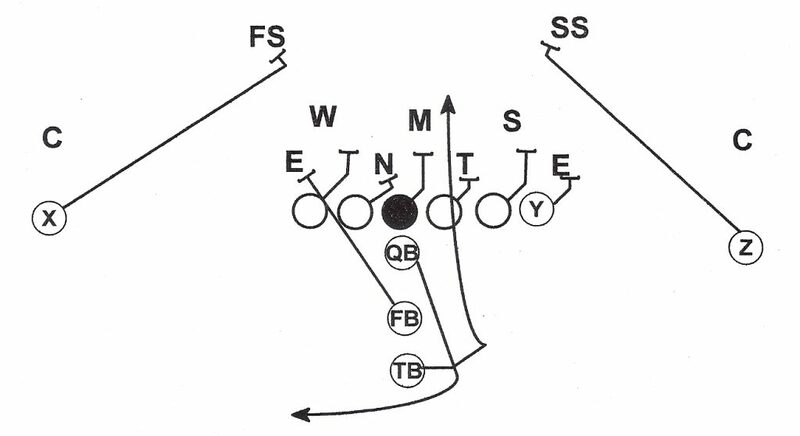 You can run this play out of one or two back sets, and out of a variety of formations. This will be Trent Richardson’s bread and butter play. Here is the inside zone play out of the same formation against the same defense. The line blocks the same, stepping together and working their zones. The tailback might shorten up his parallel steps, allowing a better read of the playside guard. If nothing is on the frontside he will cut back and follow the fullback’s block on the backside. Remember in the West Coast Offense every running play has a corresponding play action pass. 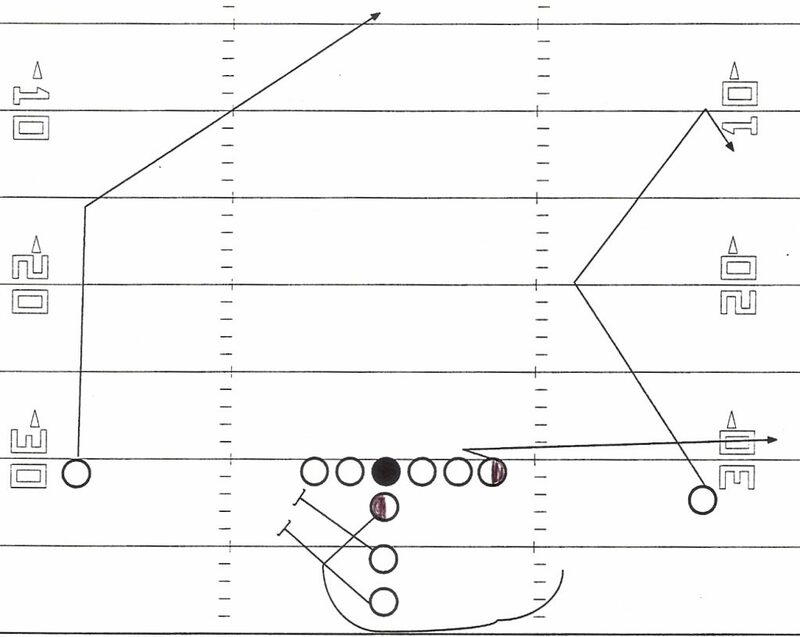 In this one off the outside zone play, all of the linemen and the running backs all still step playside, giving the impression it is a running play to the left. The quarterback then rolls “naked” (unprotected) to the backside. Remember in the West Coast Offense the idea is to move the sticks. Depending on the yardage needed, or how quickly the defense gets in his face, the quarterback will be looking for the tight end or the outside receiver doing the hitch route. The backside receiver going deep is to occupy the safeties and stretch the field to allow the under receivers to have more room to work. This is the type of play a West Coast Offense quarterback must be able to make.